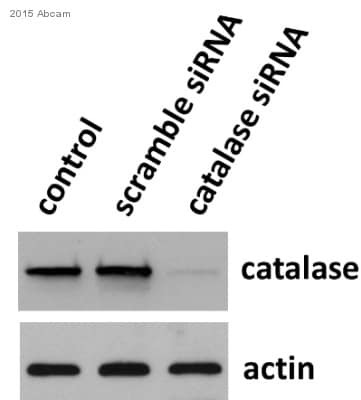 Knockout Tested Rabbit recombinant monoclonal Catalase antibody [EP1929Y]. Validated in WB, IHC, ICC and tested in Human. Cited in 8 publication(s). Independently reviewed in 1 review(s). Synthetic peptide within Human Catalase aa 400-500 (C terminal). The exact sequence is proprietary. WB: HeLa cell lysate. IHC-P: human brain tissue. Our Abpromise guarantee covers the use of ab76024 in the following tested applications. WB 1/10000 - 1/20000. Detects a band of approximately 60 kDa (predicted molecular weight: 60 kDa).Can be blocked with Human Catalase peptide (ab225865). IHC-P 1/100 - 1/250. Perform heat mediated antigen retrieval before commencing with IHC staining protocol. Lanes 1 - 3: Merged signal (red and green). Green - ab76024 observed at 60 kDa. Red - loading control, ab9484, observed at 37 kDa. ab76024 was shown to specifically react with CAT when CAT knockout samples were used. Wild-type and CAT knockout samples were subjected to SDS-PAGE. Ab76024 and ab9484 (Mouse anti GAPDH loading control) were incubated overnight at 4°C at 5000 dilution and 1/20000 dilution respectively. Blots were developed with Goat anti-Rabbit IgG H&L (IRDye® 800CW) preabsorbed ab216773 and Goat anti-Mouse IgG H&L (IRDye® 680RD) preabsorbed ab216776 secondary antibodies at 1/20000 dilution for 1 hour at room temperature before imaging. Immunohistochemical staining of Catalase in paraffin embedded human normal brain tissue using ab76024 at a 1/100 dilution. Publishing research using ab76024? Please let us know so that we can cite the reference in this datasheet. Can you please send me the ab98210 and the ab25987 ASAP. I spent a considerable amount of time and sample on the previous antibody and I need to get these westerns done so I can publish. I noticed the ab25987 has a lead time of 4-6wks so please send the ab98210 right away since the lead time is 1-2 wks and I need to get going on these westerns. I am happy to share any western data with my rat samples to update the datasheets for you. Thank you for confirming these details and for your cooperation. The details provided enable us to closely monitor the quality of our products. I am sorry this product did not perform as stated on the datasheet and for the inconvenience this has caused. As requested, I have issued a free of charge replacement with the order number 948366. To check the status of the order please contact our Customer Service team and reference this number. Please note that this free of charge replacement vial is also covered by our Abpromise guarantee. Should you still be experiencing difficulties, or if you have any further questions, please do not hesitate to let us know. I wish you the best of luck with your research. I would like to inform you aboutthe customer complaint. Some time ago my clientordered antibody ab76024, which was dedicated to work on rats. The client was not happy with the results of experiments. The results were the main topic of her research. After some time, she decided to return to studies using this antibody. The client is very surprised by the fact that Abcam deleted the informationthat this antibody is suitable for use in the rat. The client feels cheated andexpects adequate compensation for financial losses. I wouldlike to mentionthat we have not received any indication that this antibody has changed its characteristics of which I should informmy customers. I look forward to favorable consideration of this complaint. I would like to apologize for this error. When we received the information, that the antibody has been tested in the laboratory with negative results on rat tissue, we updated immediately the datasheet. This was last automn. Indeed, I do not know why we have not sent out the emails to the customers to inform about the issue. I would double check this with the responsable people. Thank you. I am very sorry that the customerhad problems with this antibody. Please remind the customer, that if in the future he/she has some problems with any of our product, to contact us as soon as possible. Our technical support team is very happy to help to troubleshoot and improve results. In the case an antibody is not working as described, we are happy to replace it (in accordance with our Abpromise guarantee). Please confirm the order number (or approximate date) of the order of this antibody and I will arrange for the credit. If instead of a credit notethe customerwould prefer an alternative antibody as recompensation, please do let me know. Thank you for your cooperation and support in this case. I am looking forward to hear back from you onhow you would like to proceed. I looked over your antibody list. Thank you for providing that. Based on my mass spec peptide coverage and the rat to human homology it looks like N-term raised antibodies are the best. I found ab16731 to look the most promising there is even a western on the website of rat liver tissue with a very clean one band! I am not sure to which antibody on your excel sheet this matches to but I think it is #27. Anyways if you could send ab16731 ASAP, if you think it is a good one for me to try? There are so many antibodies to try for catalase but this had a lot of different tissue types from rat that it has worked in so hopefully it will work in kidney. Also I have no human lysates to use for a control could you send me some? Thank you for all your help. The ab16731 is not specific to N-terminal end of the protein. It is produced using recombinant fragment of whole protein and because it is a polyclonal antibody so it will bind to multiple epitopes. It is likely that ab16731 will be able to detect the catalase in your sample. However we can not 100% confirm this without comparison with positive control. I am sending you the lysates ab29545 (Hela cell lysates) which you can use as positive control. I would also recommend trying ab98210 side by side which will help to determine whether the lysates were problematic or antibodies. The Order number I have created for these products is 975321. You will be receiving these products on Monday. I will look forward to receiving the results soon. Thank you for sending the image which is very self explanatory for multiple bands. Please ignore my suggestions for multiple bands as these were more general rather than related to this case. The antibody (ab98210) I recommended was the second most suitable antibody based on your immunogen requirements. I am sorry that the antibody did not give expected results. In order to help further I have compiled an excel file of all the anti-catalase antibodies we have in catalogue, along with their immunogen details. Could you please have a look and choose the antibody you would like to try. Unfortunately the immunogen of all these antibodies is from human Catalase protein which is not 100% homologues to Rat protein or at least in the sequence requirement as per your mass spec data. I therefore would be happy to refund the money in case you could not find the product which is a perfect match. Please click to open the sequence similarities info between Rat and Human protein; http://www.ebi.ac.uk/Tools/services/web_clustalw2/toolresult.ebi?tool=clustalw2&jobId=clustalw2-I20111027-112818-0636-62047582-pg Please choose product from the attached list and contact me for replacement. I would again suggest using human lysates as a positive control. I hope these suggestions will be helpful. Should you have question please do not hesitate to ask. Thank you for your email. I am sorry to hear that the results did not improve. The multiple band problem could be due to following reasons: - High protein conc. of lysates per well - High conc. of primary and secondary ab - Cell confluence or cell passage - Cleavage products - Active protease inhibitors etc. I would like also to ask about the step you have altered for troubleshooting purpose. Could you send me an image and lysates details? Have you used any positive control lysates also? Looking forward to hearing from you soon. 1) Abcam product code ab76024 2) Abcam order reference number or product batch number lot:GR1737-3 3) Description of the problem The antibody is not detecting any catalase in my samples that have previously shown a large amount of catalase by mass spectrometry.See attached pptx file which in yellow highlights all peptides detected by mass spectrometry on same sample. Catalase is in my sample based on many spectra and peptides identified for this protein. 4) Sample preparation: Type of sample: Proximal convoluted cells isolated from rat kidneys and organelle(mitochondria, peroxisomes, & etc) isolated by sucrose gradient Lysis buffer: RIPA Protease inhibitors: PMSF Phosphatase inhibitors; NONE Reducing agent: BME Boiling for ≥5 min? Yes and no, I have tired both ways Protein loaded ug/lane or cells/lane Positive control: Whole cell lysate from Proximal convoluted cells isolated from rat kidneys which little is detected. Negative control 5) Percentage of gel: 10% Type of membrane: PVDF Protein transfer verified: YES Blocking agent and concentration: Thermo Non-protein blocking buffer Blocking time: 2 hours Blocking temperature: RT 6) Primary antibody (If more than one was used, describe in “additional notes”) : Concentration or dilution Diluent buffer: Blocking buffer with 0.1% Tween Incubation time: O/N Incubation temperature:4 degrees 7) Secondary antibody: Species: mouse Reacts against: Rabbit Concentration or dilution: 1:10,000 Diluent buffer Blocking buffer with 0.1% Tween & 0.01% SDS Incubation time: 30 minutes Incubation temperature: RT Fluorochrome or enzyme conjugate:Fluorochrome 8) Washing after primary and secondary antibodies: Buffer; TBS 0.1% Tween Number of washes 3X 9)Detection method 10) How many times have you run this staining? All the time nothing new in our lab. Do you obtain the same results every time? What steps have you altered to try and optimize the use of this antibody? The following dilutions of primary tired: 1/10,000, 1/5,000, 1/2,000, 1/1,000 all O/N 4degrees See attached file and let me know if you need more details. Thank you for contacting Abcam Technical Team and for taking the time to provide some useful details of the experiments. I am very sorry to hear that you are having problems with this product. I have been discussing this issue with some colleagues in the Lab. Regrettably, I have been informed that ab76024 is no longer recommended for use in rat samples based on internal test results. I have just amended the on-line datasheet to reflect this. I appreciate the time you have spent on these experiments in the laboratory and it is disappointing the results have not been successful. I am very sorry for this discrepancy and can certainly offer you either an immediate refund or a credit note which you can use in the future. Please do let me know how you wish to proceed with your enquiry.